Baker Ross is a family owned and run company that aims to provide the very best in arts & crafts for children in playgroups, schools and at home. Founded by Patti Baker in 1974, Baker Ross has over 80 hard working staff based in its office in Essex, all of whom are dedicated to supplying thousands of organisation and members of the public every year. 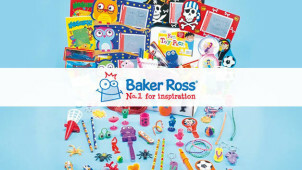 Along with its devotion to helping children achieve their creative goals through art and crafts, Baker Ross is very proud of its vast stock of products. As of 2017, Baker Ross offers over 3,000 items through its website and catalogue, and covers a vast range of different events, and styles. If you are thinking of holding a child’s party but like the idea of making it creative and educational rather than chaotic and crazy, arts & crafts is a superb idea. In addition to this Baker Ross also sell party supplies, toys and stationery - it’s the ideal place to make that party a time to remember! How do I use my Baker Ross promotional code? If you fancy saving a bit of cash on your purchase, why not sign up to Baker Ross’ newsletter? Just leave your email address and get special offers and discounts sent directly to your inbox! Does Baker Ross offer a price match? Yes. Baker Ross promises to match any price from a competitor. Click here to read more. Will I have to sign for my Baker Ross parcel? Yes the carrier will not leave your order without a signature. Can I check my order Baker Ross order’s progress? To check your order’s progress simply sign into your account. If you are not satisfied with your order then you have 30 days to return your product for a full refund. Let your creative spirit fly free with Baker Ross! Use our Baker Ross voucher code and let your imagination run wild with arts & crafts - it could be for a birthday, a special event like Halloween or Christmas, fun for children or a personal work of art! Baker Ross is the number one arts & crafts retailer in Ireland and with its huge catalogue and varied themes, will definitely have what you are looking for! Baker Ross prides itself on its massive range of products for many varied themes. Baker Ross offers a comprehensive collection of items dedicated to Chinese New Year, helping you celebrate one of the most important events in the calendar. It could be colourful stickers, a design-a-fan kit, a paper lantern with LED lights or toys for your children - Baker Ross has it all to help your Chinese New Year party get started! In the last few decades Halloween has gradually become a more and more important date to celebrate in Ireland, with its good natured fun and exciting costumes. Use our Baker Ross voucher code and stock up on all manner of craft activities, toys & treats, stickers, pumpkins and masks! Get your children all ready and excited for one of their most important nights of the year - get those scissors, pens and glue out and get making!